Second Skin Spectrum is a vibration killer that can be painted on! Spectrum is a fantastic water-based coat type noise and resonance reducer, one that can easily be painted on to sheet metal, like the sheet metal found behind a car’s under board upholstery. Spectrum uses a coat that is formulated with a special, cryogenic activated polymer mesh that also provides an intense heat barrier, capable of providing noise and resonance reduction that you can only otherwise see in high-end luxury cars, made for a sophisticated crowd. Tests have consistently shown that a single coating of the Spectrum water based coating is enough to produce noise and vibration reduction that is 300% more efficient than the vibration and sound protection provided by traditional, heavy, difficult to install sound dampeners like tar boards and OEM dampers. A step by step guide on how to properly apply Spectrum from start to finish. To understand how Spectrum can provide you luxury-car like quiet, you must understand how “road noise” is developed. When you operate your car, the engine, the tire’s traction with the road and even the exhaust all emit strong vibrations that carry sound waves. When left unchecked, these vibrations creep into the car, through the sheet metal underside that most cars have. Spectrum will help improve your audio system in several ways. Since it is a vibration damper it will obviously reduce the panel vibration caused from your speakers allowing your music to sound clearer. It also strengthens the cars panels helping to "trap" the bass in your car. Another way Spectrum improves your audio system is by reducing ambient sound like road noise, engine noise & exhaust drone. When you can quiet down the rest of the car, the stereo has less sonic real estate to fight for, and the perceived volume increases. Even if you are using one of our vibration mats, Damplifier or Damplifier Pro, you can still stand to gain from a gallon or 2 of Spectrum. Adding as little as 1 gallon to to the areas of the car you are unable to reach with your damping mats, can help in increase surface coverage by as much as 15%. Anything you place in front of a heat source will help reduce or slow down the heat. Spectrum will help reduce heat to a small degree but is not specifically designed to do so. Any heat reduction noticed from Spectrum is purely a side benefit, not an intended result. Sludge has the consistency of peanut butter and is too thick to spray, but can easily be applied with a putty knife, trowel or paint brush. Due to the ultra viscous nature of Sludge, only one thick coat is needed, making it better for quick and easy installs. Once cured the products will perform exactly the same, weigh the same and will look nearly identical. like allL water based products Spectrum will take 30 full days to cure but will be dry to the touch in 30-60 minutes depending on the ambient temperature and humidity. 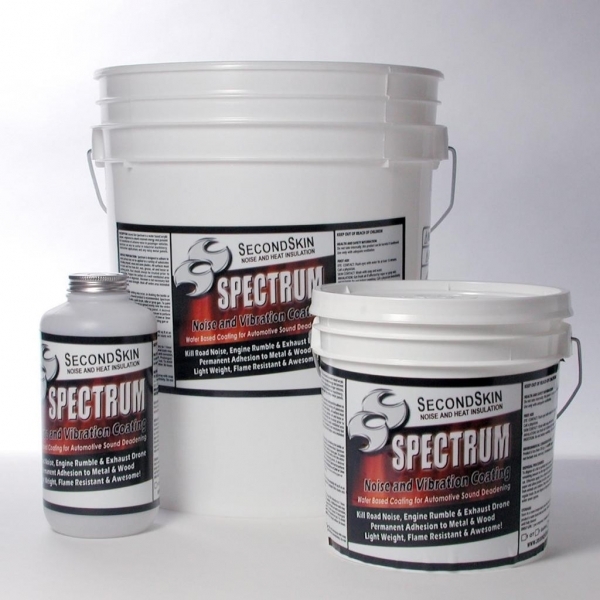 We suggest that you allow a minimum of 2 days for Spectrum to dry before reinstalling your upholstery. What is better, Spectrum or Damplifier Pro? We suggest using Damplifier Pro as your base foundation inside the car, on all the panels hidden by upholstery, then use Spectrum in the hard to reach spots. (A single gallon can increase surface coverage by as much as 15% in a moderate size car which can mean a large reduction in unwanted noise. Then use the Spectrum independently as and undercoating on the underside of the cars floor pan. This will sandwich the sheet metal floor between Damplifier Pro & Spectrum, allowing for the ultimate approach in vibration deadening.